We know, we know. Camera phone lenses have been featured here before. But hold on a minute. What sets this new fisheye lens apart is that it’s universal to all camera-endowed smartphones and stand all by its lonesome. Unlike the rest of the competition, it doesn’t come in a case or encumber your phone too much. Whether it’s for your iPhone or similar devices, this lens guarantees excellence providing quality pics that will flood your social networking commitments. This is basically the value of the new fisheye lens being sold by Photojojo. When it’s not stuck on your phone thanks to a magnetic ring that secures them in place, barring a serious ‘accident’ like dropping it off a cliff, you can carry it around or tie it someplace using the strap. One fisheye goes for $25. However, if you’re quite the accessories inclined person, plop down $40 for a bundle that includes the fisheye, wide angle, and macro variants. But in case you’re short on cash, hey, a mere $20 gets you both the wide angle and macro—no fisheye though. If you ask our opinion, we consider this a steal. 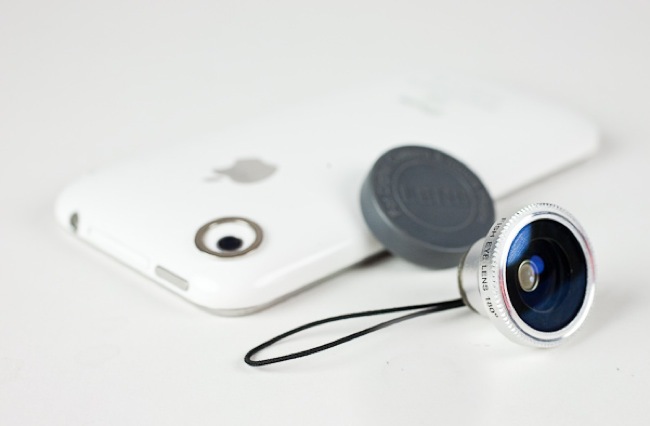 Mr. iPhone, meet Mr. Fisheye.